My tree is decked out with all sorts of new and wonderful ornaments this year. I love them so much I had to share. We got two "Our First Christmas" ornaments. The first is one I bought myself. 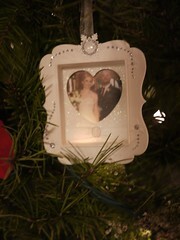 I just was so excited about having my first married Christmas I had to commemorate it with an ornament. I ordered it from Etsy from Something About Silver. It's simple and light weight so it won't make the branches hang too low. Plus I loved the packaging it came in. The other one is from my lovely new parents-in-law. 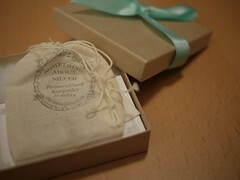 It has a little picture from our wedding inside. A true Hallmark memory. 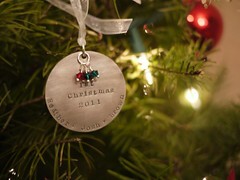 Then I got an ornament from my friend Beth. 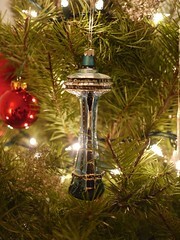 She got us this awesome Seattle Space Needle ornament. I just love it! All my other ornaments are stored at my parents home in Encinitas. Some day I'll have an apartment big enough to store more Christmas stuff. Not to mention, figure out a way to transport them all up here. And on the decoration-front. 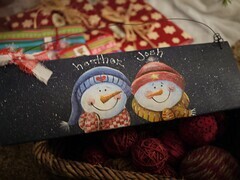 Josh and I also got this super adorable Christmas sign from Brown family member Julie. It's freaking cute. Do all my posts about Christmas have you in the spirit yet?